Note: This post originally appeared in the Huffington Post on 2/13/2015. I've said before that we are in the midst of a golden age for children's literature. Well, if the early returns are any indication, 2015 might very well be a new high water mark in the modern era of picture books. There are a staggering number of great titles this year, and none have caught people's attention more than Matt De La Peña and Christian Robinson's modern classic, Last Stop on Market Street. If there was one defining theme from 2014's book world, it was the growing demand for diversity (led by the highly influential and successful #WeNeedDiverseBooks campaign). 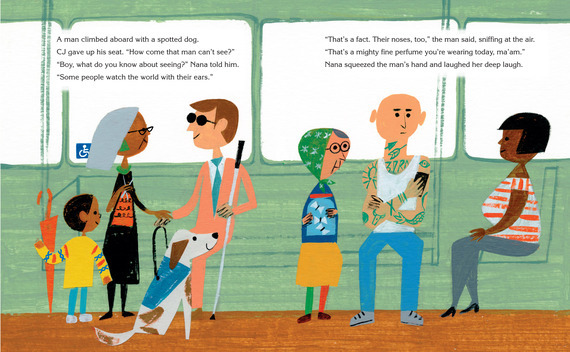 Last Stop on Market Street is a sophisticated and forceful answer to that call, not because it is a book that is about diversity, but because it is a compelling portrait about family, compassion, and our common humanity -- set in a diverse world. De La Peña's finely tuned text conveys a deep wisdom (through the relationship between a boy and his kind but no-nonsense Nana) without ever becoming pedantic and Robinson's illustrations elevate the mundane setting of a bus ride by infusing it with a sense of childlike wonder. A story that strikes that fine balance between being timely and timeless, don't be surprised to see this book making frequent stops during award season (including one to pick up the coveted Caldecott) before taking its deserving place among the all-time greats. The Bear Ate Your Sandwich by Julia Sarcone-Roach (Random House): An unexpected (and possibly unreliable narrator) recounts the tale of a missing sandwich. Sarcone-Roach's clever narration and rich illustrations will leave you hungry for more. 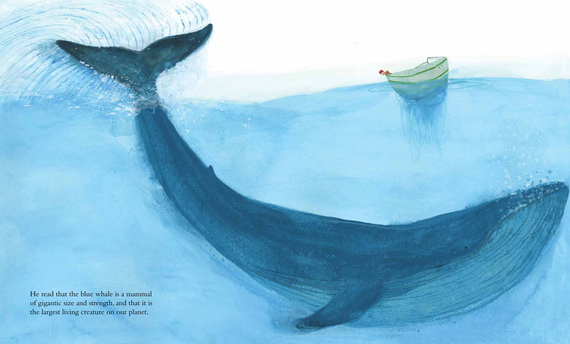 The Blue Whale by Jenni Desmond (Enchanted Lion): A work of nonfiction that understands that true expertise is born out of curiosity. Filtering the storyline through one inquisitive young child, Desmond joyfully presents facts about the earth's largest mammal in a manner that is both accessible and engaging, and will definitely spark the reader's curiosity. By Mouse & Frog by Deborah Freedman (Penguin): All Mouse wants to do is tell a story, but the overly enthusiastic Frog keeps hijacking the narrative. Metafiction with an odd couple cast, by the time the two friends learn the tricky art of collaboration, the book may be over... but their story is just beginning. The Case for Loving: The Fight for Interracial Marriage by Selina Alko, ill. by Sean Qualls and Selina Alko (Scholastic): Interracial marriage may not seem to be a highly contentious issue anymore, but that makes it all the more important to revisit the (very recent) historical struggles and breakthroughs that got us to this point--particularly given that the fight for marriage equality continues in the courts to this day. Enormous Smallness: A Story of E. E. Cummings by Matthew Burgess, ill. Kris DiGiacomo (Enchanted Lion): The title of this book (Enormous Smallness) is perfect. Many of us think of poems as small things, but as much as anyone, E. E. Cummings showed us that even the smallest stanza could hold enormous meaning. Lovingly written (Burgess is himself a poet) and ingeniously illustrated, this book is a treasure for both fans of Cummings, as well as those discovering his poetry for the first time. Hoot Owl: Master of Disguise by Sean Taylor, ill. Jean Jullien (Candlewick): A hungry owl with a flair for the dramatic provides his own narration as he flies through the dark enormousness of the night in search of food. By far the most fun read aloud of the year so far, I recommend reading it with your best In a World movie trailer voice. In a Village By the Sea by Muon Van, ill. by April Chu (Creston): At first glance, In a Village By the Sea appears to be a traditional story about family, but Van's clever nesting doll narrative and Chu's playful illustration gives this family's story a healthy sprinkling of magic. 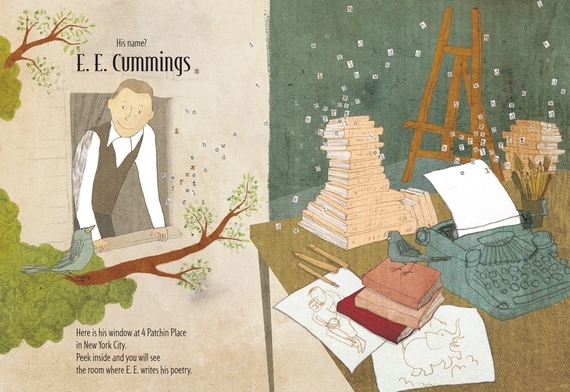 My Pen by Christopher Myers (Disney-Hyperion): An invitation for children to explore the infinite possibilities of the blank page, My Pen is a thoughtful meditation on the power of the imagination. Appropriately rendered in black and white to mimic an artist's sketchbook, Myers wants every reader to realize that they have a story to tell. So, what are you waiting for? Pick up that pen and get going. Pool by JiHyeon Lee (Chronicle): In this wordless adventure, a boy discovers a wonderfully surreal world hidden in the depths of a busy pool. Without saying a word,Pool speaks directly to introverts like myself, who believe (or at least hope) that if you want to discover something truly special, you have to look beneath the surface. Red by Jan De Kinder (Eerdmans): There are plenty of books out there on this topic, but few are this adept at capturing the organic nature of childhood bullying. In Red, a young girl laughs at a boy's rosy cheeks and inadvertently sets off a chain reaction that leads to the whole class piling on. De Kinder's intense artwork packs an emotional punch, making it that much more powerful when the girl takes it upon herself, through a lonely act of bravery, to reverse the momentum. The Skunk by Mac Barnett, ill. Patrick O'Donnell (Macmillan): Question: What would have happened if Alfred Hitchcock directed an episode of Looney Tunes? Answer: The Skunk by Mac Barnett and Patrick O'Donnell. Supertruck by Stephen Savage (Macmillan): Look! Up on the shelf! It's a bird! It's a plane! It's a brilliantly designed book that kids will love and demand to read over and over again! It's SUPERTRUCK! 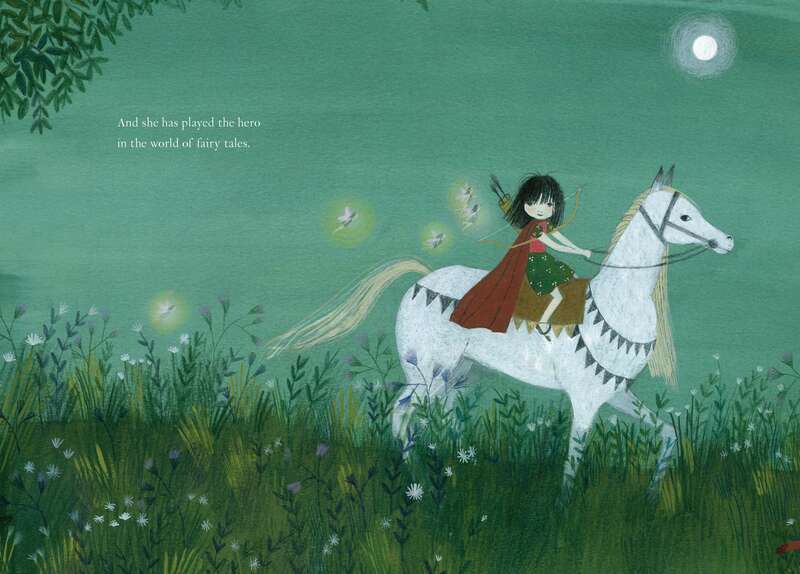 This is Sadie by Sara O'Leary, ill. Julie Morstad (Tundra): Sadie is a young girl who revels in the power of her imagination and is not limited by silly things like traditional gender constructs. The dynamic duo of O'Leary and Morstad have crafted a quiet but powerful celebration of childhood with a heroine that is a role model for boys and girls alike. 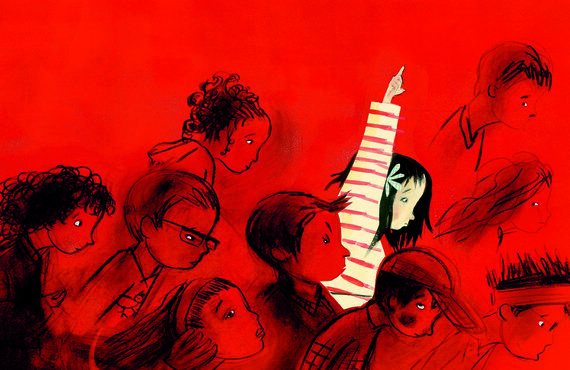 Readers should be prepared to reserve a special place on their shelves -- and in their hearts -- for the incomparable Sadie. Tricky Vic: The Impossibly True Story of the Man Who Sold the Eiffel Tower by Greg Pizzoli (Penguin): Pizzoli's true crime caper is so fun and stylish, don't be surprised to see George Clooney on the big screen as the dashing Robert Miller (aka Count Victor Lustig). As a bonus, the book includes Tricky Vic's "Ten Commandments for Con Artists," which turns out to be surprisingly good advice for everyday use. My favorite is #8: "Never boast. Just let your importance be quietly obvious." Trombone Shorty by Troy "Trombone Shorty" Andrews, ill. Bryan Collier (Abrams): This portrait of a musical prodigy turned musical icon has the benefit of being both true and modern (Trombone Shorty is still only 26 years old). Andrews has a foundation whose mission is to preserve and continue New Orleans' rich musical tradition -- and this book, which is accompanied by Collier's always jaw-dropping art, should help bring more attention to that worthy cause. Wangari Maathai: The Woman Who Planted Millions of Trees by Franck Prévot, ill. Aurélia Fronty (Charlesbridge): Inspired in part by one of her mother's favorite expressions ("A tree is worth more than its wood.") Maathai was determined to make a difference -- and in the end she brought profound change to her community, her country (Kenya), and eventually the world. Winner of the 2004 Nobel Peace Prize, this book gorgeously preserves Maathai's life story, which will continue to inspire future generations. Water is Water: A Book About the Water Cycle by Miranda Paul, ill. Jason Chin (Macmillan): Creative nonfiction at its best. 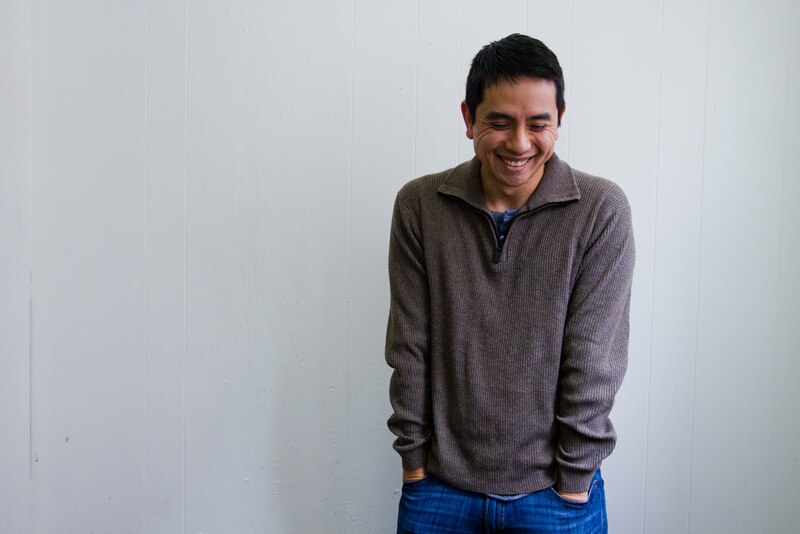 Chin (who raised eyebrows last year with his innovative nonfiction book Gravity), has a confident yet subtle style that brings to mind a modern day Norman Rockwell. Paired with Paul's rhythmically paced text, this exploration of the water cycle will not only teach today's children, but will also serve as a useful refresher for older readers as well. What a Wonderful World based on song by Bob Thiele and George David Weiss (as sung by Louis Armstrong), ill. Tim Hopgood (Macmillan): Hopgood does the impossible and makes a song as ubiquitous as What a Wonderful World feel fresh again. With dazzling artwork that jumps off the page, the colors of the rainbow never looked prettier. Wolfie the Bunny by Ame Dyckman, ill. Zachariah OHora (Little, Brown): With Dyckman's perfect comic timing and OHora's distinctively bold style, this is the most charming book of the year so far. 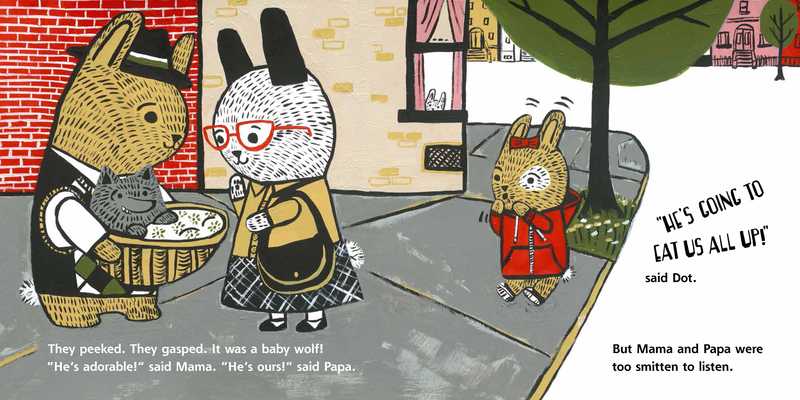 If the cover (which features a wolf cub in a pink bunny jumpsuit) doesn't automatically bring a smile to your face, then watching Dot adjust to life with her new and potentially dangerous sibling will make you want to eat this book all up. Yard Sale by Eve Bunting, ill. Lauren Castillo (Candlewick): Facing financial struggles, a family is forced to move into a smaller place -- and as a result, sell most of their belongings. 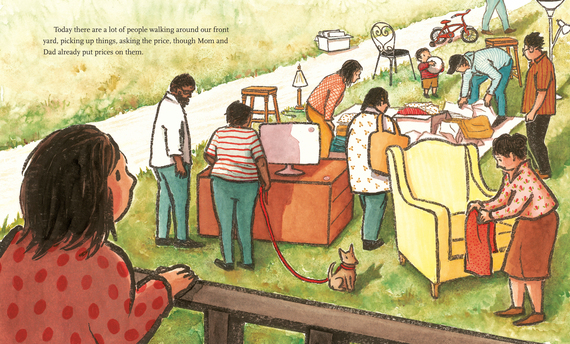 Skillfully and subtly told from the child's perspective, Yard Sale is simultaneously heartbreaking and heartwarming. For you moviegoers out there, Bunting and Castillo (fresh off her Caldecott honor for Nana in the City) hit the same (bitter)sweetspot as Richard Linklater's critical darling, Boyhood. But wait, I'm not done yet. Here are twenty more notable titles coming our way in the first part of 2015. Like I said, this is a really strong year for picture books. If the year keeps up this pace, I'm going to have to invest in some new bookshelves.